The Committee for Medicinal Products for Human Use (CHMP) has recommended the approval of Pfizer lung cancer drug Vizimpro (dacomitinib) 45 mg in Europe as monotherapy for the first-line treatment of adult patients with locally advanced or metastatic non-small cell lung cancer (NSCLC). The positive opinion adopted by the European Medicines Agency (EMA) committee is for the use of the Pfizer lung cancer drug for the treatment of such patients with epidermal growth factor receptor (EGFR)-activating mutations. Last year, Vizimpro was approved in the US for the first-line treatment of patients having metastatic NSCLC with EGFR exon 19 deletion or exon 21 L858R substitution mutations as found by an FDA-approved test. The Pfizer lung cancer drug was also approved recently in Japan for EGFR gene mutation-positive, inoperable or recurrent NSCLC. 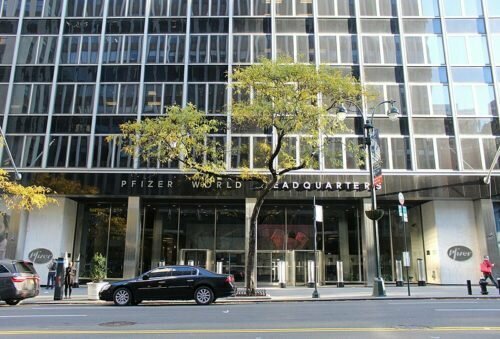 Pfizer lung cancer drug Vizimpro bags CHMP’s positive opinion. Photo courtesy of w:ru:jenix89 (talk | contribs) and Wikipedia.org. The Marketing Authorization Application (MAA) for Vizimpro is backed by the findings of the phase 3 ARCHER 1050 clinical trial held in 452 patients with locally advanced unresectable, or metastatic NSCLC harboring EGFR exon 19 deletion or exon 21 L858R substitution mutations. The trial enrolled patients who did not undergo any therapy in the past for metastatic disease or recurrent disease with a minimum of 12 months disease-free following completion of systemic therapy. The efficacy of the Pfizer lung cancer drug was shown in the ARCHER 1050 clinical trial in comparison to gefitinib 250 mg.
Vizimpro is an oral, daily once, irreversible pan-human epidermal growth factor receptor kinase inhibitor. Chris Boshoff – Chief Development Officer, Oncology, Pfizer Global Product Development, commenting on the CHMP’s positive opinion on Vizimpro, said: “Patients with EGFR-mutated non-small cell lung cancer, a disease that is associated with low overall survival rates, are in need of more treatment options. This positive CHMP opinion is an important step toward bringing this treatment to patients in Europe as a potential new first-line treatment option.